Practically all cameras have a built-in light meter to measure the amount of light in a scene and either adjust the exposure automatically (auto exposure) or recommend settings for you to apply yourself (manual exposure). These light meters have become increasingly sophisticated as camera makers try to anticipate and deal with every kind of exposure situation, so now cameras will split the scene up into smaller sections, measure the light in each section and calculate the optimal exposure for the overall scene. This is called different things by different camera makers. Canon calls it 'Evaluative' metering, Nikon calls it 'Matrix' metering, and it's also variously called 'multi-pattern' or 'multi-segment' metering. Multi-pattern metering works pretty well for getting a usable exposure across a wide range of conditions. It's not foolproof, because the camera can't always guess at the kind of effect you're trying to achieve, and high-contrast lighting and backlit subjects can still confuse some metering systems. Different makers tune their multi-pattern systems in different ways, so that many beginner cameras will favor shadow areas in a picture, while pro models will often try to preserve the brightest parts on the assumption that photographers can lighten the shadows if they need to. All of these things make multi-pattern metering the most reliable method overall, but also a little unpredictable – it can be quite difficult to second-guess what the camera is going to do. That's why camera makers also include a simpler, cruder center-weighted metering mode. This harks back to the days when film cameras had just a single light receptor measuring light across the whole scene; more weighting was given to the centre of the scene, because it was assumed that's where the subject was most likely to be. Center-weighted metering can be highly effective even now. It's more easily fooled by tricky lighting conditions, but it's also much easier for experienced photographers to work out when that's going to happen and adjust the exposure if they need to. Some cameras even offer an older 'averaged' system where there's no weighting at all, and the camera's meter simply measures the total amount of light across the whole frame. 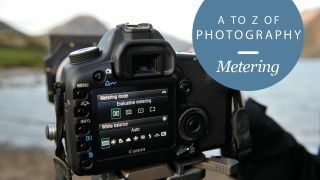 Spot metering is the third mode found on digital cameras, and this is for taking highly selective readings from only a small area of the scene. It could be useful if you're photographing a spotlit performer on a dark stage, for example, where you don't want the dark surroundings tricking the camera into overexposing your subject. But spot metering needs to be used with care. You have to position the spot very carefully to get an accurate reading, and that's not easy if your subject is moving. You also need to make sure you choose a representative midtone area from which to take your reading. And this idea of representative midtones is very important because of a limitation in the way in-camera metering works. In-camera light meters have one major flaw, and it's why camera makers continue to offer manual exposure overrides. They can only measure the light reflected from the subject, and this is influenced not just by how much light is falling on them, but how much is bounced back to the camera. In fact, cameras have to work on the assumption that your subject is an average grey tone (historically, '18% grey'), but very often they're not, and two examples are the mythical black cat in a coal cellar and a bride in a white wedding dress. The camera has no idea that one is supposed to be black and the other is supposed to be white, so the best it can do is come up with an exposure where they come out a regulation 18% grey. That's obviously not right, and that's why all cameras have exposure compensation dials, so that photographers can correct the exposure when the camera gets it wrong. This is unlikely to change unless cameras eventually learn to 'recognize' subjects using the kind of artificial-intelligence machine learning now appearing in search tools – you can bet that someone, somewhere is working on it. So although metering systems are growing ever more sophisticated and reliable, there will still be times when you need to take over by swapping metering modes to cope with awkward lighting, or using exposure compensation for unusually dark or light subjects. You know how you want your subject to look, while the camera can only make an intelligent guess.